All mounts of Astro-Physics can be operated completely via the keypad. A PC or laptop is not needed. The Keypad is a self-contained handheld computer that allows you to control all essential telescope functions and includes an extensive database of objects. 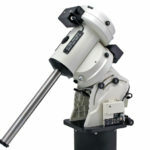 Astro-Physics has designed this unit to be as intuitive and easy to use as possible, while filling it with terrific features to make your observing session productive and pleasurable. more than 17,000 objects in extensive databases: Messier (110), NGC (7840), IC (5,386), ADS double stars (215), Abell galaxy clusters (2,712), calibration stars by common name (200), Greek star names by constellation (1053), common objects (100), planets (8) , Moon and Sun. SmartGuide control provides variable speed capability to both axes. The Keypad can be used with all versions of the Astro-Physics GTO Control Boxes: GTOCP1, GTOCP2, GTOCP3 and GTOCP4. Compatible mounts include: Mach1GTO, 1100GTO, 1600GTO, 3600GTO and the older 400GTO, 600EGTO, 900GTO and 1200GTO. For detailed information about the GTO Keypad please visit the original website of Astro-Physics.